You can use this guide as a photo tour to see all the beautiful reasons you want to go. It's also a driving tour. This Lake Tahoe driving tour starts at Tahoe City, the only outlet for Lake Tahoe's waters, located on the west side of the lake. It's a loop tour that ends in the same place it started. It goes around Lake Tahoe clockwise, which always keeps you on the lake side of the road for the best views. To use it for your drive, start at the point closest to your lodging. The drive all the way around the lake with no side trips is a little over 70 miles. When there are no traffic jams at South Lake Tahoe, it takes about 3 hours with no stops. The section of Highway 89 between South Lake Tahoe and Tahoe City may be closed in winter because of snow and danger of avalanches. Check road conditions online, use your smartphone app if you have one or call 800-427-7623. If it is closed, you can still travel around the rest of the lake but will have to backtrack to return to your starting point. You'll find some things to explore in Tahoe City before you go, including a bridge with a funny name. The bridge that carries CA Hwy 89 over the Truckee River is affectionately called "Fanny Bridge" for the backside view of all the people peeping over the edge. Join them and feed the trout in who swim below. 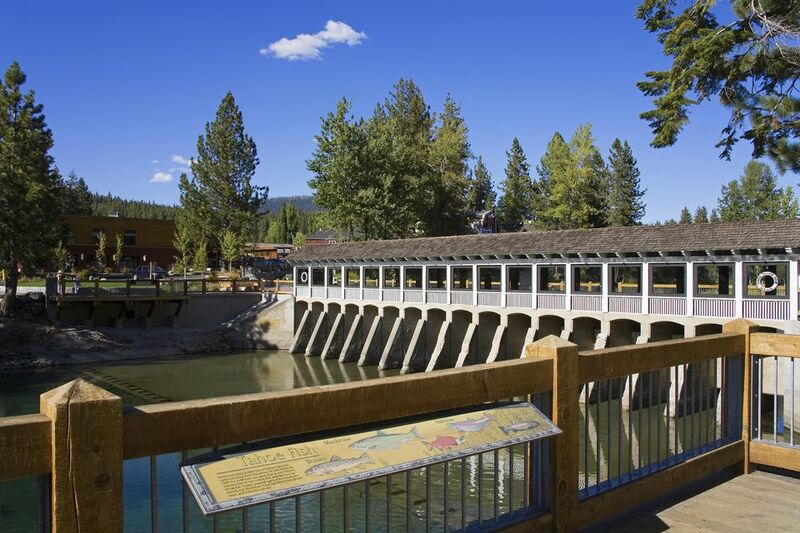 Just downstream, the Truckee River is a great place for a leisurely rafting trip. Use the Truckee River rafting guide to find out how you can join the fun. Annual events in Tahoe City include summer movies and concerts at Commons Beach, Fourth of July fireworks and the SnowFest Parade, held in March. To get started on the driving tour, go north. If you've been at the bridge, you may be on CA Hwy 89, which makes a hairpin-shaped turn west just north of the bridge to follow the river. From the intersection just north of the bridge, take CA Hwy 28 north toward Tahoe Vista and Kings Beach. Scenic, Alpine Squaw Valley is surrounded by soaring peaks, known for hosting the 1960 Winter Olympics. It's 5 miles north of CA Hwy 28 on CA Hwy 89. Squaw Valley encompasses is about a half mile wide and two miles long, with a ski resort and several lodging options. The European-style Village at the mountain's base offers dining and shopping year round. From there, you can take the Funitel (gondola-style lift) to Gold Coast eateries or the cable car to High Camp. With a base elevation of 6,200 feet, Squaw Valley USA boasts six mountain peaks, ranging in elevation from 7,550 to 9,050 feet. The highest of over 30 lifts goes to about 8,700 feet. Average annual snowfall is 450 inches (11 meters). Most years, ski season starts around Thanksgiving and in a snowy year, it might extend into April. During peak season, they run Tahoe's most extensive night skiing area. While Squaw Valley is well-known for "challenging" skiing, only a third of its runs are rated for experts and it also has several snowboarding areas. Lessons and clinics are available for all levels of ability. Other winter activities include ice skating, cross-country skiing, snow tubing, snowshoeing and dog sled tours. Twilight dinner packages are available at High Camp, December through March. At High Camp, you'll find a swimming lagoon, spa and tennis club, Olympic Museum and places to eat. Summer concerts are held at High Camp. Other summer activities in the valley include biking, golf, and horseback riding. The nearest airport is Reno, NV (30 minutes away). For other ways to get there, see the guide to getting to Lake Tahoe. Squaw Valley is 8 miles south of I-80 on Hwy 89, 96 miles from Sacramento and 196 miles from San Francisco. North Lake Tahoe straddles two states and includes the towns of Tahoe Vista and Kings Beach, California and Crystal Bay and Incline Village, Nevada. It's the older part of Tahoe, tourist-wise, with lots of old-fashioned motor inns along the highway. Coming into North Lake Tahoe, you'll pass some pretty bays and nice lakefront homes, some with piers punctuating their shorelines. Carnelian Bay is home to wooden boat builder Sierra Boat Company and the site of an annual Concours d'Elegance event featuring elegant wooden cruisers. Crossing the border from California into Nevada at North Lake Tahoe, the only noticeable change is that gambling becomes legal. You might think that Cal Neva Resort didn't want anyone else to get the traveler's eye before they do: it straddles the state line. Its most famous owner, Frank Sinatra visited often in the early 1960s, along with his Rat Pack pals who also performed in the Celebrity Showroom. Today, it's one of several casinos clustered near the border in North Lake Tahoe. Further around the North Lake Tahoe shore is Incline Village, named for an inclined tramway built in 1878 and today a locale where some of the world’s wealthiest folks have built extravagant mountain retreats. From North Lake Tahoe, continue on your clockwise drive by following NV Hwy 28. Northstar at Tahoe is also a side trip (about 5 miles) off CA Hwy 28, reached by taking CA Hwy 267 north from Kings Beach. Northstar at Tahoe is skiing and resort area, located just over the crest of the mountains from Lake Tahoe. Any time of the year, The Northstar at Tahoe Village provides restaurants, outdoor activities. and some nice shopping. You'll also find a gas station on the way in, with lower prices than you may find nearer the lake. Guests at the Northstar Resort can also enjoy the spa and fitness center. Northstar at Tahoe has long been known as a family-friendly ski resort, good for skiing and snowboarding. Base elevation is 6,330 feet (1,929 meters), the summit is 8,610 feet (2,624 meters) and average annual snowfall is 350 inches (9 meters). Mt. Pluto is the family skiing spot and intermediate skiers like Schaffer's Camp. The Backside provides long, uninterrupted runs of groomed powder and bumps, while Lookout Mountain offers plenty of steeps and tree skiing. Terrain parks are available for snowboarders and freestyle skiers. Learn to ski or improve your skills with a wide range of lessons for both skiers and snowboarders. Other winter activities include ice skating, snow tubing, and cross-country skiing. And when you're tired out from all that, buy a s'mores kit and roast those marshmallows around one of the outdoor fire pits. Just a few miles north of Kings Beach and Tahoe's north shore, Northstar offers some of the area's most comfortable lodging, much nicer shopping than at the lake - and it's quieter and less crowded. In summer, you can go mountain biking, play tennis, roller skate and watch outdoor movies in the evening. Guests at the Resort can play or take lessons at the highly-rated tennis center or do a few laps in the swimming pool. Northstar lodging includes hotel-style rooms, condos, and rental homes. All are located within the complex and connected by convenient shuttle buses. The nearest airport to Northstar at Tahoe is Reno, NV (30 minutes away). The resort offers a free shuttle from the Reno airport once per day. Northstar is 8 miles south of I-80 and 6 miles north of Kings Beach on Hwy 267. Lake Tahoe offers summer Shakespeare with a pre-show lakeside view at Sand Harbor State Park. The Lake Tahoe Shakespeare Festival performs in an open-air venue on the east shore of Lake Tahoe, between sand dunes and a rocky mountainside. One of its special charms is the laid-back ambiance as people gather, set up beach chairs, picnic on the sand and settle down to get ready for the show. If you are visiting from out of town and can't pack a picnic from home, you can pick up something to eat at the on-site food stands and join them. When a summer sunset paints the sky rose and gold, it can momentarily upstage the players, but that's another one of the festival's charms. We give the Tahoe Shakespeare Festival 4 stars out of 5, a full 5 stars for its excellent location and atmosphere and 3 stars for the quality of its productions. Even if you don't like Shakespeare, be a good sport and go with someone who does or choose their Sand Harbor Music Series instead. You can always count the stars in the sky if the ones on stage don't interest you. There are several classes of seating at the Lake Tahoe Shakespeare Festival. Discuss them with the reservationist if you get your tickets in advance. Arrive by about 5:00 and get in line for the best seats. Bring warm clothing. The wind off the lake gets quite chilly after dark. Food stands are available inside the Lake Tahoe Shakespeare Festival entrance or bring your own. Bring a flashlight for the trip back to your car. The parking lot is not lighted. Sand Harbor State Park is about 6 miles south of Incline Village on NV Hwy 28 and can be reached from north or south. It's on the west (lake) side of the road. If you'd rather not hassle with driving there yourself, add a shuttle ride to your ticket purchase. It runs from The Summit in Reno or from the Festival's Incline Village office. Virginia City is an enjoyable side trip during your Lake Tahoe driving tour. Allow two to three hours to go there and get back. Virginia City, Nevada is about 30 miles each way from the point where NV Hwy 28 dead ends at US Hwy 50 near Spooner Lake. The side trip goes north, via US Hwy 50 north through Carson City, then NV Hwy 341 and NV Hwy 342 north. Virginia City was the most important settlement between Denver and San Francisco for a time in the nineteenth century, thanks to the discovery of silver in the Comstock Lode in 1859, a strike that yielded almost 7 million tons of silver ore over twenty years. In the peak year of 1877, the mines poured out over $14,000,000 of gold and $21,000,000 of silver. Among those who made their fortunes in Virginia City, Nevada silver were George Hearst, whose fortunes fueled son William Randolph Hearst's publishing empire; William Chapman Ralston, founder of the Bank of California and four Irishmen: John William Mackay, James Graham Fair, James C. Flood and William S. O'Brien, who formed the Consolidated Virginia Mining Company. Today, Virginia City, Nevada is a lively, open-air museum of sorts, with a fun main street lined with historic buildings and fun shops. Buy a Silver Line Express ticket and you can take in all the shows, museums and mine tours for one price. Railroad aficionados and anyone else who just likes old trains can ride the Virginia & Truckee Railroad train from Virginia City to Gold Hill and Carson City. They make special runs on Halloween. To continue on the driving tour without going to Virginia City, take south US Hwy 50 toward Stateline, NV and South Lake Tahoe, CA. South Lake Tahoe is the name of the California town that sits on the lake's edge at the state border, but the larger South Lake Tahoe area include Stateline, Nevada and the California state parks along CA Hwy 89. By far the biggest town in the area, South Lake Tahoe is where most of the biggest hotels and casinos are, with the casinos on the Nevada side of the border. To continue your driving tour after leaving South Lake Tahoe, take US Hwy 50 through South Lake Tahoe, then turn north on CA Hwy 89 north toward Tahoe City. A Scandinavian-style house whose former residents are as interesting as its architecture. The former summer home of millionaire heiress Lora Knight, Vikingsholm was built in 1929. Because the rugged mountain scenery and sheer granite cliffs surrounding Emerald Bay reminded her of the fjords in Norway, Knight chose a Scandinavian design. It’s a house with many unusual features, including a sod roof seeded with wildflowers and carved dragon-heads at the peak of the roof. Whimsical touches inside include Selma, a folk art clock. Upstairs, the delicate colors of the stained paneling are unchanged, and Mrs. Knight’s collection of Scandinavian antiques and museum reproductions are as interesting as the architecture itself. We rate Vikingsholm 4 stars out of 5 for its unusual architecture and interesting history, but if these characteristics don't appeal to you, skip it. Limited parking is available in the Vikingsholm parking lot off of CA Hwy 89 on the southwest side of Lake Tahoe, above Emerald Bay. A one-mile-long steep trail leads from the parking lot to Vikingsholm. If this parking lot is full, head for the day use area at Eagle Point State Park, pay a small fee and follow the 1.5-mile trail along the south shore of Emerald Bay, which is less steep. There are no concessions at the house, the hike back up is steep and the air dry, so bring some water with you. 1 Memorial Day is celebrated on the last Monday of May. CA Hwy 89 travels north from South Lake Tahoe toward Tahoe City, climbing over the mountain's edge just above scenic Emerald Bay. Portions of the highway between Emerald Bay and Tahoma may close between mid-November and late February because of snow and danger of avalanches. Check road conditions online, use your smartphone app if you have one or call 800-427-7623 for the latest information. Also expect road closures and delays between Tahoe City and Camp Richardson on Sunday morning during the Lake Tahoe Marathon, usually held the last weekend in September. Check to see how they might affect you. This map shows the locations of all the stops and sights on the Lake Tahoe driving tour. If you'd like to get driving directions or exact distances, use the interactive version of a Lake Tahoe map at Google maps.